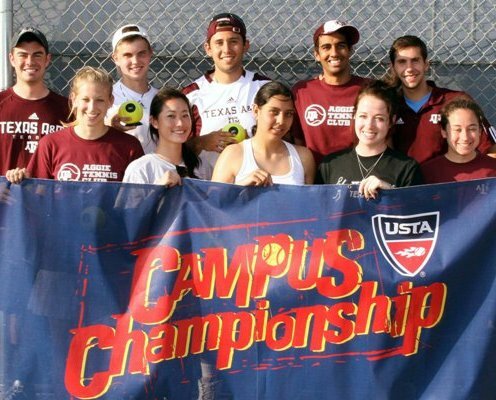 The USTA Tennis On Campus Texas Championship is a fun and competitive event for collegiate club and intramural tennis teams from across the state of Texas. The first event took place in 2002 with only 6 teams from 3 schools and, now, just eight short years later, hosts 76 teams from 28 unique schools! The Championship, which uses the exciting, dynamic, and co-ed World TeamTennis format, is the culmination of the Texas Tennis On Campus Series which begins in the fall with 8 one-day Regional events. The top finishers at the USTA Campus Championship - Texas are granted automatic bids to the USTA National Campus Championship and receive a stipend from the USTA Texas Section to attend the National Championship. In addition, the USTA Texas Section also gives a stipend to the team receiving the USTA Texas Tennis On Campus Club of the Year Award to attend the USTA Tennis On Campus National Championship.